NDSU › Yard & Garden Report › Documents / Should You Aerate Your Lawn? Almost all lawns benefit from aeration and early fall is a great time to do it! Almost all lawns will benefit from aeration, and a great lawn demands it. That said, most lawns do not need it. Lawns suffering from heavy foot traffic, excessive thatch (>1 inch thick) or grown on heavy soils will benefit most. Invigorate roots and stimulate new growth. Enhance movement of water and nutrients into the soil. Late August to mid-September, after the lawn has broken out of its summer dormancy. These lawns are primed for optimal growth. Spring is another good time. Hollow tine or core aerators are best. These have hollow metal tubes that remove plugs out of the soil. These aerators are available at rental agencies. Lawn care services will offer aeration. Avoid solid-tine or spiking devices that may compact the soil. Remove cores as deeply as possible, about three inches. The soil should be moist but not wet. Tines cannot dig deeply in dry soils and tines will get plugged in wet soils. A few passes are usually needed. After aeration, what’s my next step to a great lawn? Let the cores dry for a couple days and mow them to break them up. Aerated lawns respond well to fertilization or overseeding; this can be done immediately after aerating. 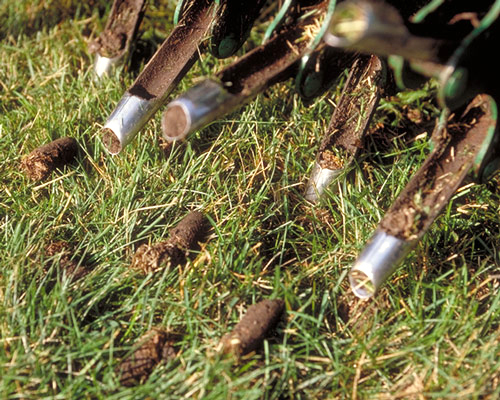 Aerate your turf once every 1–5 years for optimal growth. Turf on heavy soils or suffering from heavy foot traffic will benefit from more frequent aeration. Written by Tom Kalb, Extension Horticulturist, North Dakota State University. Published in the NDSU Yard & Garden Report for August 18, 2017. Photo courtesy of Zone8 Landscaping & Lawn Care. Source: Stier, J.C. 2000. Lawn aeration and topdressing. University of Wisconsin.